The hit-maker, whose real name is Timothy Mosley, will join the US rapper as he performs seven shows around the country, including four gigs at London's O2 Arena, reported Capital FM. The 41-year-old collaborated with Jay Z (Shawn Carter), producing 11 tracks on his number one album, Magna Carta... Holy Grail. 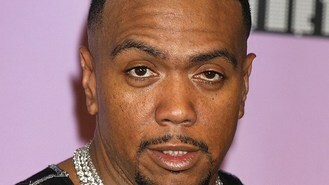 The duo previously had a fall-out during the making of The Blueprint 3, with Jay Z blaming Timbaland's ego for the feud. They put any differences aside, with Jay Z signing him up to his record label Roc Nation in January 2013. "It seemed like it was more about him than the actual album. When you go and make an album, you have to put all ego aside... He wasn't accepting of that thing and that was almost the last straw type of thing, and we just went our separate ways," the hip-hop star told BBC Radio 1. Jay Z's Magna Carta tour will start at Manchester Arena on October 3 before heading to Birmingham and London. Timbaland - who has also produced for Justin Timberlake, Madonna and Rihanna amongst others - is working on his new album, Shock Value III, which is expected to be released in 2014. He has also been teasing work on new Michael Jackson material and al so helped Justin Timberlake with his new album, The 20/20 Experience 2 Of 2. "I have a lot of unreleased Michael Jackson. LA Reid said, 'How would you like to do Michael Jackson?' Of course I'll do it. It would complete my legacy," he told Revolt TV.